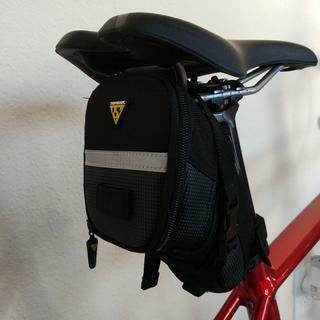 The Topeak Wedge bag fits right up against your seat for minimum drag and is big enough for your flat kit, keys, wallet, and a snack. Uses Topeak's Nylon Straps/Buckle system for easy mounting and removal. Be aware to buy this one with Velcro attachement, there is another version with a plastic clip, it does not work for MTB. The bag fits perfectly under the saddle, medium size is perfect, I place a small inflator inside + tube + patches + multitool + levers and there is some room left. I have it for over a year, and it seems it will last. Was easy to install. The medium fits my spare tube, multipolar, patch kit, and tire lever. Perfect size. Glad I didn't get the large. Hangs low off the saddle and hits the rear wheel of my full suspension. Doesn't adjust up tight to the seat. Lots of space to hold tools and a 29er tube. Saddle bag fit nice and snug. It holds a tube, co2 tank, and has room for much more. Got this for my mtb. Holds 2 - 29" tubes , 3 tire levers 4- 16 oz. co2 canisters. And still has room. This delivery was mixed up with another customers. Called support and they got it fixed and the correct parts arrived 3 dags later. Did not get the large, med is more than adequate size for medium range rides. The only problem that I have with this bag is that out of the 2 I ordered 1 has a problem with the zipper coming unzipped over moderate trail conditions. I also bought 2 of the large bags and they are way beyond the size needed for riding trails (no zipper issue with these ones). They would be good for bike-packing though. Great little bag that thinks its a big bag. Think Felix the magical cat. It's small yet expandable. It holds for me, two inner tubes, two air cartridges, a multi tool, a chain tool, and a patch kit. This is without expanding it. It goes on easy. Straps are sturdy and won't rip unlike other cheaper seat bags I've purchased. This handy seat bag holds quite a bit of supplies and fits snugly under seat. Very well designed seat bag. One, admittedly minor, complaint is the interior of the bag; it would be better if it was a light gray color. Surprised at the large capacity. My last bag got damaged and the connectors ripped off, so I had to replace it. For the price, this was a great buy! I have room to spare and it zipps in the middle expanding the storage another few inches, which is great should I need to add another CO2 cartridge or two for longer trips or maybe my folding pliers. Got this to use with the fat bike. Large enough to carry a spare tube, 2 large volume CO2 canisters, irons, and other spare goodies. Very impressed by the volume and the shape prevents it from too bulky or unsightly. Is well built, but makes contact with your legs while pedaling. 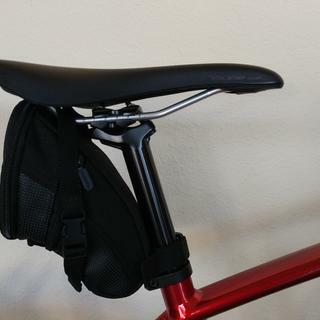 The body of the bag runs down the seat post too far. Probably not an issue with the smaller sizes. First saddle bag I've purchased in awhile and I really like it. I use it between my gravel bike and mountain bike. What are the dimensions for the different sizes?